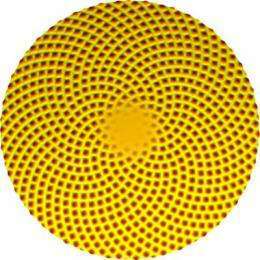 This image shows the pattern on the head of a sunflower as generated by a mathematical model of plant growth. Credit: Matt Pennybacker, University of Arizona. When people on airplanes ask Alan Newell what he works on, he tells them "flower arrangements." He could also say "fingerprints" or "sand ripples" or "how plants grow." "Most patterns you see, including the ones on sand dunes or fish or tigers or leopards or in the laboratory  even the defects in the patterns  have many universal features," said Newell, a Regents' Professor of Mathematics at the University of Arizona. "All these different systems exhibit strikingly similar features when it comes to the patterns they form," he said. "Patterns arise in systems when they're under some kind of stress, applied stress." Newell will be talking about the universality of patterns in nature and how those patterns are created, with an emphasis on plants, on Friday, Feb. 18 at the 2011 American Association for the Advancement of Science annual meeting at the Washington Convention Center in Washington, D.C. In 1917, Thompson published an extremely influential book, "On Growth and Form," in which he argued that biological forms are controlled more by the laws of physics than by evolution. Newell agrees that many of the biological  and non-biological  forms in nature are the products of physical forces, rather than evolutionary ones. In his talk, he will discuss how the arrangement of flowers, bracts, florets and stickers near the growth shoots of plants  known as phyllotaxis -- is a consequence of biochemically and mechanically induced pattern-forming instabilities. "All the lovely patterns on plants have their origins in mechanical forces and biochemical processes," he said. Newell and his students approach the problem of patterns in plants from a mechanistic point of view, he said. "We look at the phenomenon we're interested in, and we learn about it, we read about it, we find out what other people say about it, and we look at the experimental evidence," he said. "Then we try to capture what we see using mathematical models." Patterns arise when the symmetry of a system is broken, Newell said. The similarity in patterns from system to system occur when the systems have similar symmetry, rather than because the systems are made from the same materials. "The mathematics elegantly captures the fact that pattern structure depends more on shared geometrical symmetries than material properties, because the simplified equations for all these very different situations turn out to be the same," he said. Newell said, "Mathematics is like a good poem, which separates the superfluous from the essentials and fuses the essentials into a kernel of truth." More information: Newell's talk, "The Universal Nature of Fibonacci Patterns," is scheduled for 9 a.m. EST and is part of the symposium, "The Growth of Form in Mathematics, Physics and Biology," to be held in Room 147A of the Washington Convention Center. The symposium begins at 8 a.m. EST. The symposium honors the 150th anniversary of the birth of mathematical biologist D'Arcy Wentworth Thompson. I think the current scientific research places too much credit on genetic factors and far too heavily discounts external forces, such as emotion, culture, and the physical world on how natural things (or people) develop physically and mentally. I for one would like to state my support of this guy's work and hope he helps bring the world to a more even balance on how things work. Sure, physics is a force that shapes and controls the environment that lifeforms evolve in, but evolution is a series of sustainable changes over time that lifeforms evolve through. Yes, they evolve, but their forms reflect the laws of physics. The sunflower pattern shown at the top of the page, with its clockwise and counterclockwise spirals (always adjacent fibonacci numbers)has been proven to be the most efficient way to pack the seeds in a circular structure. So I wonder if it would be possible to glean additional information about laws of physics by looking at these patterns. Patterns or structure formation arising through symmetry breaking is a fundamental part of physics and its investigation will continue to be critical to the understanding of the world and the universe at large.